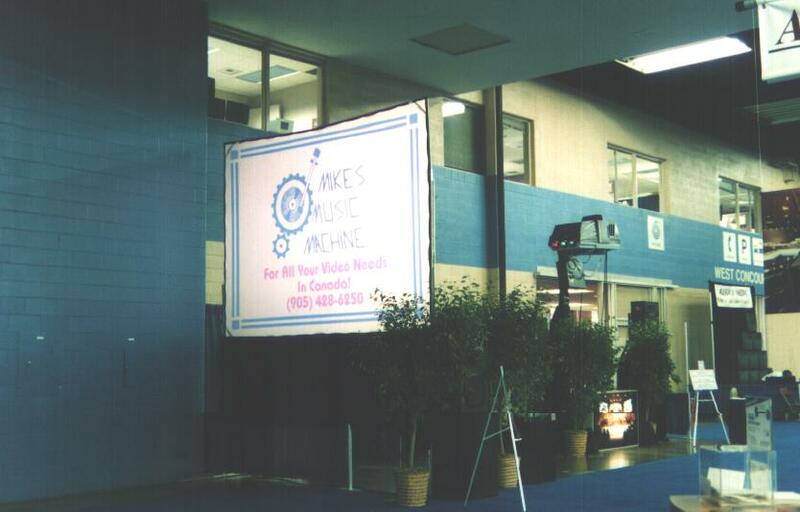 Welcome to Mike's Music Machine - 180" screen in fully lit trade show! Very High Power - 180" screen at a fully lit trade show. Below is a picture of a 180" (9' x 12') rear screen with a bright image that you can see with all the lights on. That is possible for two reasons. 1: A Very High Power Projector, and 2: Our special, secret High Gain Video Screen that provides an image that is twice as bright as a standard screen. You will notice that there is no dark-tunnel or draping to shield the screen from room light. We provided the same screen and similar power projector for the Canadian Gemini Awards. Imagine a screen that size on a television stage, with a bright enough image to use as scenery with a fully lit performer in front. We have the experience and knowledge to calculate exactly what you will need to get the results you want!